What is copper? Copper, "the red metal," is one of the most electrically conductive of all the metal elements. While its electrical properties, in combination with its ductility and malleability, have helped copper to become an integral component of the world's telecommunications. It has an aesthetically pleasing red color (that easily oxidizes to a gritty green patina) that also makes the metal a favorite material for artists and architects. Strength: Copper is a weak metal with a tensile strength about half that of mild carbon steel. This explains why copper is easily formed by hand but is not a good choice for structural applications. Toughness: Copper may not be strong, but it is not easy to break due to its high toughness. This property comes in handy for piping and tube applications, where a rupture can be dangerous and expensive. Ductility: Copper is very ductile and also very malleable. The electrical and jewelry industries benefit from the ductility of copper. Conductivity: Second only to silver, copper is not only an excellent conductor of electricity but also of heat. As a result, copper serves well in applications such as cookware, where it quickly draws heat to the food inside. Copper, according to archeological discoveries, was the first metal used by Neolithic mankind to supplement his stone tools over 10,000 years ago. The majority of the copper mined in the Roman Empire came from Cyprus and was called Cyprium or later Cuprum, hence the modern name, copper. Around 5000 BC, bronze, an alloy of copper and tin, brought a new era of easy manufacturing with copper. Copper's antibacterial properties were used in ancient Egypt to sterilize water and prevent infections. By 600 BC, copper also saw its first use as a medium of monetary exchange. According to Copper.org, the top six sectors of North American copper consumption are building wire, plumbing and heating, automotive, power utilities, air conditioning and refrigeration, and telecommunications. The International Copper Association estimates that global copper consumption in 2014 was roughly 21 million metric tonnes. Copper is extracted from ore rich in copper sulfides, which is mined today from large open pits in South America, North America, Asia, Africa, and the Middle East. After refinement, the copper can be sold in various industrial forms or as copper cathodes, which are commodities traded on the COMEX, LME, and SHFE. Copper is also readily recyclable, providing a source of copper other than the limited reserves that are presently minable. Bronze: 88-95% Cu by weight. Used in coins, cymbals, and artwork. Aluminum bronze: 74-95% Cu by weight. Higher corrosion resistance than regular bronze and useful in marine applications. Brass: a wide range of alloys containing 50-90% Cu by weight. Made into everything from ammunition cartridges to doorknobs. Cupronickel: 55-90% Cu by weight. Used in coins, marine applications, and musical instrument strings. Nickel silver: 60% Cu by weight. Contains no silver, but has a similar appearance. Often made into musical instruments and jewelry. Beryllium copper: 97-99.5% Cu by weight. Incredibly strong but toxic copper alloy that does not spark, making it safe for use in dangerous gas environments. 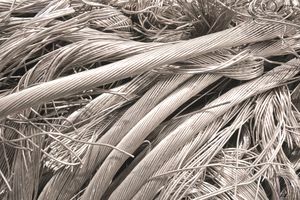 While copper is a superior electrical conductor, most overhead electrical lines in the world are made out of aluminum due to its lower cost and similar effectiveness. Copper was harvested in a very pure form by 4000 BC in the Lake Superior area in the United States. Natives used the metal for weapons and tools, and from the 1840s until 1969, Copper Harbor was one of the most productive copper mining sites in the world. The Statue of Liberty is clad in over 62,000 pounds of copper! Her characteristic green color is called a patina, the result of exposure to air in her first 25 years.